What are some good snacks for my child? 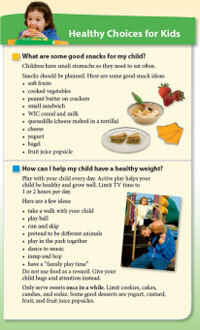 How can I help my child have a healthy weight? Play with your child every day. Active play helps your child be healthy and grow well. Limit TV time to 1 or 2 hours per day. have a "family play time"
Do not use food as a reward. Give your child hugs and attention instead. Only serve sweets once in a while. Limit cookies, cakes, candies, and sodas. Some good desserts are yogurt, custard, fruit, and fruit juice popsicles. What about fast food and "junk food"? Fast food: A fast food meal once in a while is fine. Limit sodas and sweet drinks. Watch out for "junk food"
TV advertising can make your child ask for many foods, like sweet cereals, potato chips, cheese puffs, candy, sodas, snack cakes, and cookies. These foods are expensive and low in nutrition. They often are high in fat, sugar, or salt. Eating too many of these foods can make your child overweight or spoil her appetite for meals. These foods can also cause tooth decay. Be sure to read the labels and buy healthy snacks for your family. Do not give popcorn, nuts or dried fruit to children under 4 years old.